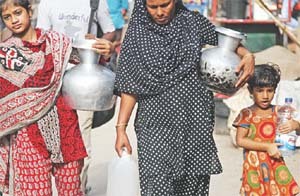 Mohammad Delowar Hossain, a resident of Mugda Jheel Par, said every week he collects about 60 litres of water from a Wasa pump at Mugda Wapda Colony. “When I fail to collect the water for some reason, my family drinks very little water because of the smell,” he said. “Even if we boil the water and use purifying tablets, we cannot get rid of the bad smell,” said Md Shafiqul Islam, a resident of South Mugda. He said every day hundreds of people go to different pumps to collect drinking water. “Sometimes I have to wait for several hours in a very long queue to get water,” Shafiqul added. Khorshed Alam, a resident of South Mugda, said the smell worsens in the dry season. Sham Baruwa, a class V student, said he and his older brother collect water from Basabo Boudhya Mandir pump every two weeks. SDM Kamrul Alam Chowdhury, deputy managing director of Dhaka Wasa, said dirty water sometimes enters the pipelines in places where there are leaks due to illegal connections. He further said they have to use more chemicals to treat the water due to severe pollution of the rivers Buriganga and Shitalakhya. “The chemicals may cause the smell,” he added. He said they will soon send officials to the affected areas to check the problem and come up with solutions.